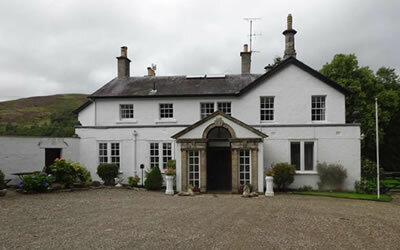 Accommodation in the Borders - When on a fishing trip having somewhere special to stay is part of the overall enjoyment. Tweed Guide has visited all the accommodation recommended to ensure that is comfortable, welcoming and a pleasure which you will not wish to leave behind when your trip comes to an end. You can almost fall out of bed and into the river Tweed, Elibank has 1.5 miles of single bank fishing on the upper River Tweed for salmon and sea trout, and excellent brown trout and grayling fishing. Each hotel or bed and breakfast establishment is special in its own way and an example of the fine hospitality and accommodation that can be found in the Scottish Borders. 2 star to luxury we can do it all. So feel confident to use any of the hotels or bed and breakfast or self catering establishments detailed below and always quote Tweed Guide when you speak to an accommodation provider. Select the type of accommodation that you are interested in or if you prefer Tweed Guide can arrange accommodation on your behalf.